We speak to the founder of Deliver Addis on the challenges the company has faced as Ethiopia's first food delivery service. “Working as a consultant, I had long hours so I’d come home hungry when all the restaurants started closing,” he says. “I had exhausted the few [dining] options and quickly realized that there were no delivery services in Ethiopia, which presented an interesting opportunity.” Two years later, that lightbulb moment led to Deliver Addis, Ethiopia’s first food delivery service. The company is the entrepreneur’s second venture since moving to Addis Ababa, the country’s capital in 2012. His first business, ArifMobile, provided assistance for Ethiopian travelers through SIM card rentals, real-time translation services and SMS alerts. When his UX design skills caught the eye of a Nigerian company hoping to expand to Ethiopia, Tsegaye shifted his focus to web and communication consulting. After he developed the concept for Deliver Addis, his clients became his first investors. Screenshot of Deliver Addis' website. Expanding tech opportunities in Ethiopia has been one of Tsegaye’s longstanding dreams. As a child, Tsegaye visited Ethiopia for the first time when the country was in the midst of war. “Despite visiting during that difficult time, what really stuck with me most was the other kids I interacted with,” he says. Today, Deliver Addis employs a small, evolving team made of up of young Ethiopians from a variety of backgrounds including IT, human resources, management and logistics. The company also works with a handful of drivers who help dispatch orders across Ethiopia’s sprawling capital. 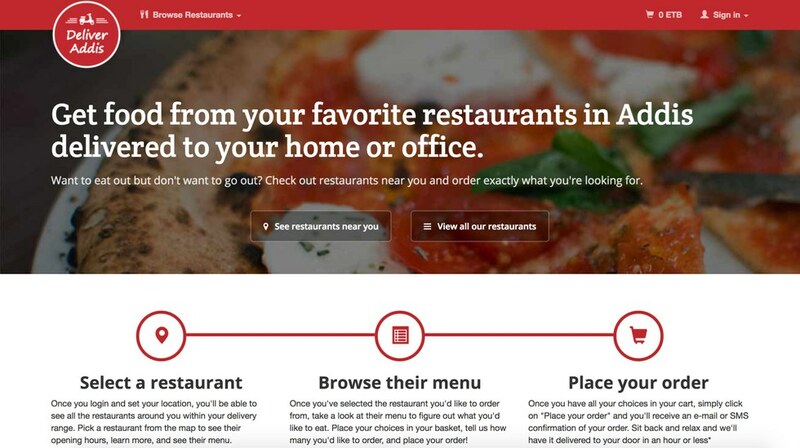 Customers can order meals from over 20 restaurants via the company’s website, and an app may soon be in the works. While Deliver Addis’ early clientele was largely made up of diaspora-born Ethiopians or expatriates, more locals are catching on to the convenience of the food delivery service. Delivery prices range between 60-75 birr (USD $2-4). But doing business in Ethiopia has come with its fair share of challenges. The first major stumbling block? Ethiopia’s lack of a formal address system. In Addis, streets often have both formal and informal names. To work around the problem, Deliver Addis requires that all customers register their delivery locations with GPS when they create an account. As Deliver Addis quickly grows through word-of-mouth, Tsegaye plans to expand its cuisine options—and the services itself. While he demurs on which sectors Deliver Addis will explore next, the founder hopes to leverage the start-up’s expertise in time-sensitive last-mile deliveries to help global logistics providers hoping to improve their operations in emerging markets like Ethiopia. In just two years of operation, Deliver Addis has mastered the tricks of the trade in Addis Ababa and Tsegaye is hungry for more. Soon, it seems, Deliver Addis could be Deliver Africa. Akinyi Ochieng is a writer and researcher of Gambian and Kenyan origin who studies the culture and politics of emerging markets. You can follow her on Twitter @kikiochieng and her blog.